Change the participants’ attitude regarding focus on impact rather than deliverables. Leadership over systems and trust over control. 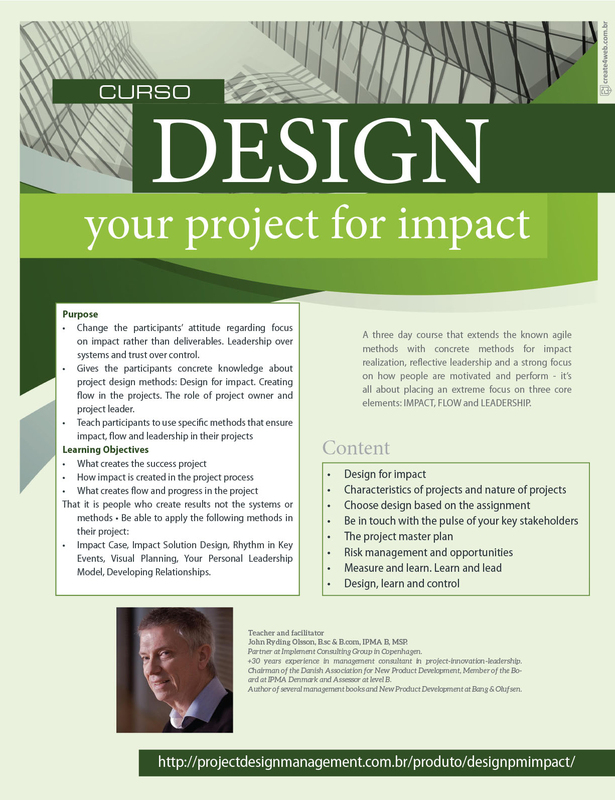 Gives the participants concrete knowledge about project design methods: Design for impact. Creating flow in the projects. The role of project owner and project leader. Impact Case, Impact Solution Design, Rhythm in Key Events, Visual Planning, Your Personal Leadership Model, Developing Relationships. The course is based on proven project management methods from the books Power in Projects, Programs and Portfolios and Half Double. 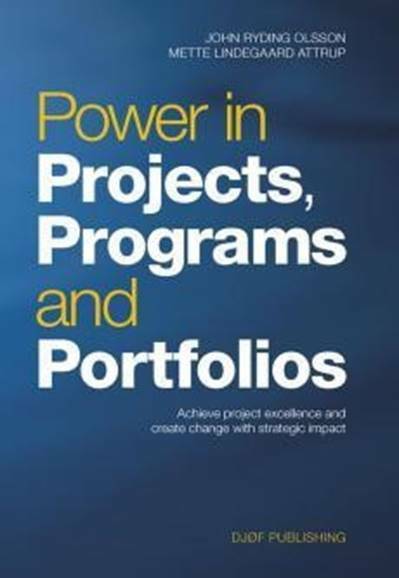 Power in Projects, Programs and Portfolios is the best-selling Danish project management book. It highlights the immensely successful Scandinavian approach to leadership within project management and takes a holistic approach to project work and project management. This authoritative book deals with classic project management disciplines and focuses on the essential link between strategic priorities, any program´s impact and a project’s powerful execution. It takes an in-depth look at areas such as change management, change communication, benefits tracking, program management and portfolio management. This book offers a large number of practical tools within project management and leadership with online access to concrete and easy-to-use practical tools and templates. 3 universities, Implement Consulting Group, 17 companies, and more than 1.400 project practitioners. 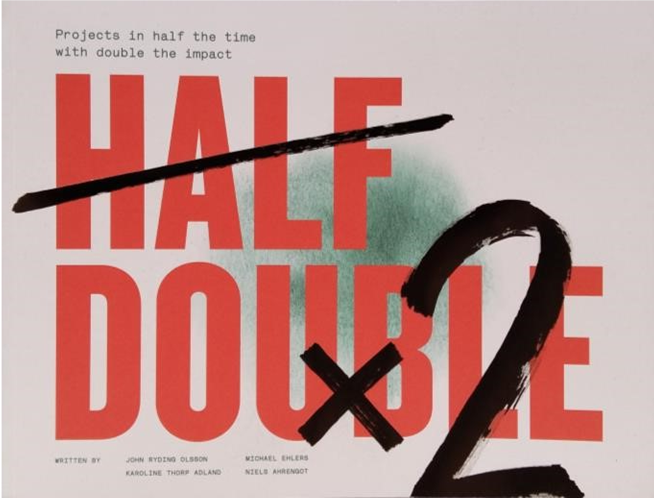 Half Double is a methodology created through practice, with practice. It has already created proven impact in projects around the globe, delivering on the overall ambition of realizing projects in half the time, with double the impact. IMPACT: We execute projects to create impact and we want to reduce the time to impact. The book value impact above scope, cost and time. FLOW: Project management should focus on creating a fast flow of ideas, learning, results and impacts. The book values flow and progress over resource optimization and multitasking. LEADERSHIP: Results are created by people. The book puts people before systems and focuses on the importance of an active project owner. Inscrição, condições e a forma de pagamento. – Certificado de Participação em Treinamento. – Prazos: a solicitação de reembolso do valor da inscrição é válida somente para requisições recebidas e confirmadas 07 dias úteis anterior a data de realização do evento. – Valores: em todos os casos incidirá no mínimo sobre o valor do reembolso descontos referentes aos custos de operações das instituições financeiras. – Limites: cancelamentos motivados por força maior serão exceções tratadas caso a caso, assim como as custas do processo. – Padrão: todos os direitos do consumidor serão aplicados como base normativa em caso de ressarcimento nesta operação de compra. O curso será realizado em 03 dias das 8:30 e 17:30 horas. Intervalos de 15 minutos para coffee-break (período da manhã e a tarde) . Experienced project managers, program managers and project owners. Não há pre requisitos obrigatórios, porém é sugerido familiaridade com o tema planejamento e projetos. What characterizes a successful project? What forces is the project up against? What are the different stakeholders’ interests and objectives? Where will conflicts occur and how are they prevented? How are the different stakeholders involved? Workshop: Develop your personal leadership model • What makes people give their very best? What is your personal code of conduct? What are the essential challenges in this project? John Ryding Olsson, B.sc & B.com, IPMA B, MSP. John has been a partner at Implement Consulting Group since its foundation in 1996. He participated in forming the company until July 2015. Today, Implement Consulting Group is one of the largest management consultancy firms in Scandinavia with more than 750 employees and offices in Copenhagen, Stockholm, Malmö, Oslo, Zurich and Munich. For more than 30 years, he worked as a management consultant with focus on project management, innovation and leadership. He has been chairman of the Danish Association for New Product Development, Member of the Board at IPMA Denmark and Assessor at level B.
John is the author of several management books including: Half Double; Power in Projects, Programs and Portfolios; Project leadership -Impact on time; Active Project Management, and New Product Development –at Bang & Olufsen. John is founder and CEO of the startup company airbornleadership.com. The company’s mission is to create inspiration and support project managers with leadership knowledge through e-learning, e-books and digital tools.